I have a lot of favorite songs – written by Pingali, Samudrala, Athreya, Arudra, SriSri, Ci Na Re, Veetoori, Veturi, Gopi, Sirivennela and Jaladi. For the past 30+ years, if you asked me what is my all time favorite song in Telugu, I would have said ‘Yaathamesi thodinaa yeru endadu…” by Jaladi. Jaladi is no more. R.I.P. 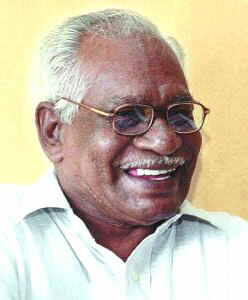 Jaladi garu. I will play a special tribute to him on my show today (Oct 14, 2011). Most people know Jaladi for his patriotic song in Major Chandrakanth – Punyabhoomi naadesam, which I love. But, I think this song about man-woman dynamic and humanity is his best. కుడితి నీళ్ళు పోసినా….. అది పాలు కుడుపుతాది…..
Ofcourse the list will have praanam khareedu song on the top. Didn’t know the first name of Jaladi is Rajarao. Many people like me are more focused on who is singing and what is being shown on the screen, but the beauty or poignancy of a scene can only be brought out only by the talented work of poets like him. They remain the unsung heroes! We as telugu people are blessed to have poets like him and for the golden period of telugu songs was ushered in by his kind in the those times. R.I.P Jaladi.